This is my first attempt at writing a journal of my nails of the day. 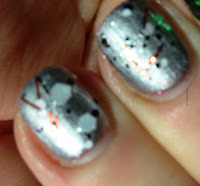 My adventures in lacquer land if you like! So today I have used two of my favourites: Zoya Logan with a ring finger accent of Lynnderella Salad Days. Zoya Logan is from the Ornate collection of 2012. It is a bright, seasonal green shot through with an apple green/gold shimmer. Unlike others in the range it isn't holographic. It feels as if it should be, would and could have been. Still, I like it and it to be honest, not everything needs to be a holo to be in my collection! Lynnderella Salad Days is well named. It is from the Summer Solstice collection of 2012. It has a fresh lettuce sort of colour, with dashes of bright, crisp vegetables scattered throughout. Carrots, radishes, red peppers and so on. Unusually for a Lynn, there is no holographic micro sparkle. Personally, I quite like that. I am all for a seasoning of holographic dust but it doesn't need to be in everything, all of the time. I was searching for a definition of Salad Days. Wiki describes it as "Salad days: is an idiomatic expression, referring to a youthful time, accompanied by the inexperience, enthusiasm, idealism, innocence, or indiscretion that one ..." well, the mind boggles! Perhaps I'll share some of those another time! Here is a close up of my ring finger accent nail. I love the combination of these two polishes, both sharing similar shades of green. It really does look like a bowl of crisp, fresh salad! I am unsure if it is the season for salad, being in the Northern hemisphere and the week just before Christmas. This is the finished look. I love the way the Zoya applies, this is two coats with no topcoat. It is shiny enough for me. The ring finger has two layers of Seche Vite to smooth out the glitters and to give a shine. I am happy with my salad days! Lynnderella polishes can be purchased only from her shop on eBay. Zoya polishes are widely available.